Junior Patricio Garino jumps for the basket during Saturday's 74-59 win over Duquesne. With the departure of Maurice Creek and Nemanja Mikic, who both shot above 35 percent from three-point range and combined for 120 of the team’s 187 long balls in their final year at Foggy Bottom, it was unclear whether the Colonials’ outside shooting would still be a threat. But in their 74-59 victory over Duquesne on Saturday, the Colonials were able to sink 12 three-pointers and go 50 percent from beyond the arc on the day, despite hitting just six or fewer in 18 of 20 games so far this season. GW’s onslaught from deep against the Dukes was its best since hitting a dozen at Auburn in November 2008, and most at home since posting 13 against Rhode Island in February of the same year. Although the Colonials currently rank a respectable sixth in the Atlantic 10 in three-point field goal shooting, averaging just less than 34 percent from the beyond the arc, they take the 10th fewest three-point attempts out of the league’s 14 teams – only 275 on the season. Usually faced with overcoming man-to-man defensive schemes that force the Colonials to drive for points in the paint, Duquesne’s two-three defensive zone lent itself to outside shooting, and the home team did not pass up the opportunity, proving exactly what they are capable of from deep. While senior forward John Kopriva and junior forward Kevin Larsen combined for just four points on the day, the GW backcourt was able to combine for 67 points, 15 assists and 12 threes, with the team’s first six field goals of the game all coming from three. Even though the zone defense opened up space around the perimeter for GW, the 12 open looks that were converted for three would not have come without good passing. The Colonials were able to move the ball as a team early, combining for 17 total assists with 13 coming in the first half alone. 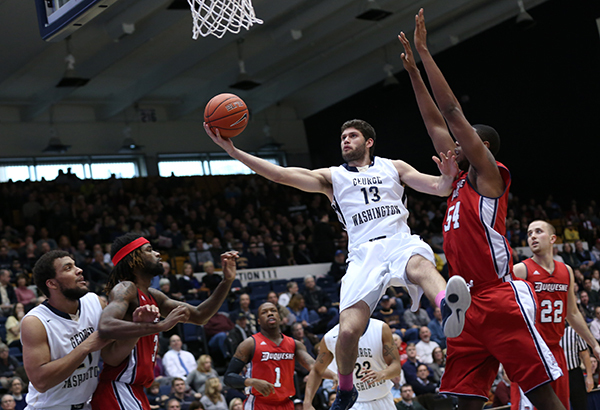 GW sits second to last in the A-10 in assists, averaging just 11.6 per game, which is an area of the game that Lonergan believes his team must improve to continue finding success. The stat sheet also stresses the importance of passing. In all four Colonials’ losses this season, they were unable to get more than eight assists in any game, while the team is a perfect 10-0 when posting at least 10. Junior Joe McDonald, who tied a career-high with four three-pointers against Duquesne, is averaging a team-high 3.2 assists per game, ranking him as the 10th-best passer in the conference. “I think we all did [a great job shooting the ball]. So just making that extra pass and having confidence in the guy that takes the shot [opened up opportunities],” McDonald said. The Colonials also got help from off the bench, including sophomore guard Nick Griffin, who hit three of six from deep, and freshman point guard Paul Jorgensen, who added two threes en route to a career-high 13-point game while also giving GW the elevated passing game it needed. But even with new life in the team’s three-point game, and riding a four-game winning streak behind improved passing, Lonergan knows what’s ahead and still thinks his team needs to improve. The Colonials return to action Tuesday when they travel to Richmond, Va. to take on No. 16 VCU at 7 p.m.